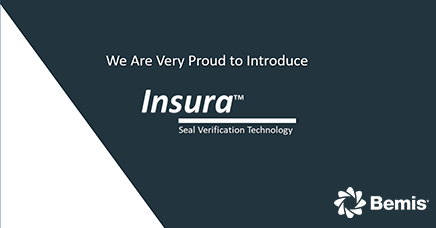 Oshkosh, Wisconsin, March 20, 2019 – Bemis Healthcare Packaging recently launched Insura™, an innovative seal verification technology designed specifically for medical device packaging. This technology is a real-time, non-destructive visual indicator of seal quality which is imbedded into the sterile barrier system. A blue color is generated under only proper seal conditions – chemistry, heat and intimate contact. “Collaborating with our customers and understanding their needs in this quality driven market led us to develop this exciting, game changing technology.” said Bemis Healthcare Packaging’s Marketing Manager, David Vanden Heuvel.